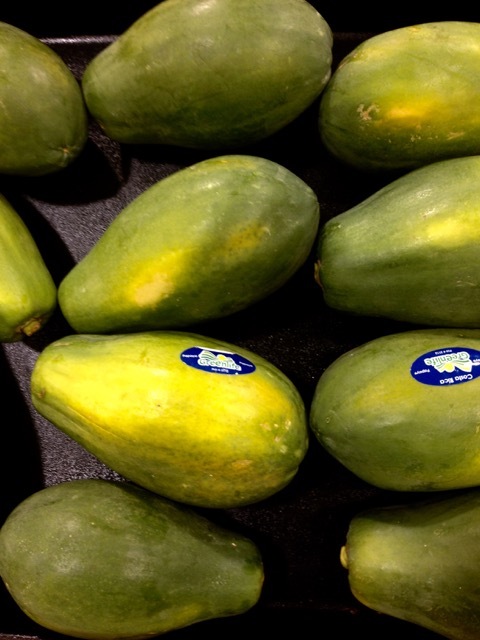 What is Papaya (Pawpaw, Papaw)? Papaya (pawpaw, Papaw) is a round, pear shaped or elongated tropical fruit with an edible orange flesh and numerous small black edible seeds. The fruit size varies and can weigh 250g (½ Ib) to 9kg (20Ib).The centre of the fruit is hollow with an oblong cavity containing numerous small back seeds. The fruits from female trees are round or oval and those from hermaphrodite trees tend to be long and narrow. 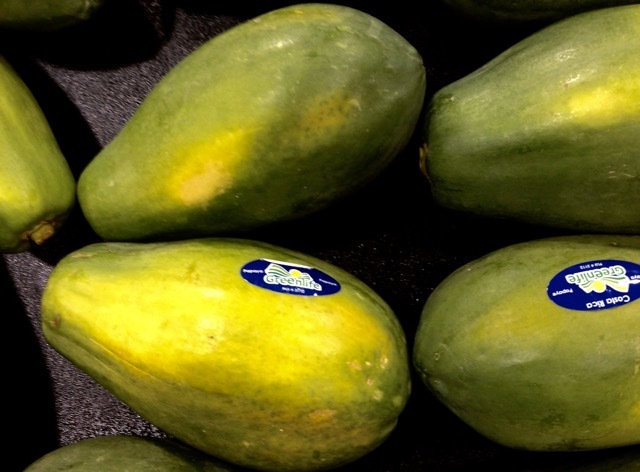 The skin is deep green when immature but turns pale green to yellow or orange to rose when ripe. The flesh may be yellow, orange or pink, sweet and succulent and is eaten ripe in fruit salads or desserts. Green papaw flesh can be used in pickles, chutneys and curried dishes. Papaya is grown worldwide in the tropical regions for it’s fruit and for papain production. The fruits grow in groups at the top of a palm-like tree. They ripen from the apex to the stem end. As they ripen, they turn green to yellow to orange depending on the variety. The green fruit and the latex are rich in the enzyme, papain used to tenderize meat. Once cut the fruit should have a fragrant and fruity aroma. Ripen papaya fruits at room temperature. To quicken ripening place in a paper bag with a banana. Store ripe fruits in a plastic bag in the fridge for up to one week but they are best eaten within two days. Cut small ones in half length wise, remove seeds and scoop with a small spoon. Peel the whole fruit, cut in half lengthwise and scoop out the seeds. Cut in wedges, or dice in cubes or slice in curves. You can also scoop flesh with a melon baller. Unripe fruits can be baked as you would winter squash or used for making chutney. Bake at 325ºF (160Cº) for 25 minutes. (The Wellness Encyclopedia of Food and Nutrition). Solo: this variety is small, pear shaped, about 6-inches (15cm) long and weighing about 250-500g (1/2-1Ib). The skin is greenish yellow with a bright golden or pinkish flesh. It’s usually very sweet compared to the larger varieties. Mexican Cultivars; these are much larger, up to 24-inches (60cm) and over 500g (1Ib) in weight. are glossy and black with a spicy pepper-like flavour. They are edible. Rinse the seeds thoroughly and use as a garnish for salads etc. (like capers) Dried seeds can be coarsely ground and used as a seasoning. (The Wellness Encyclopedia of Food and Nutrition). 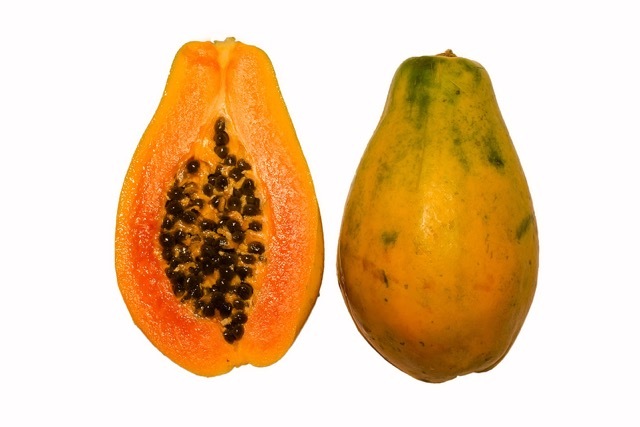 Papaya trees bear fruit all the year round but peak in early summer and fall in North America. Isn’t paw paw the North American custardy fruit (Asimina trilobal)? This paw paw is not the north American one. This one is the one from the tropics. They both have the same nam but they are different species! I have never eaten the north American one! Me neither, I have never even seen it (the North American) other than in photos. I wonder what it tastes like!!! I grew up calling it paw paw while Gilligan’s Island influence people to use the other word. In my mind it’s always paw paw. Same to me the only name I know is paw paw!!!! !